It was just 10.5°C at the start line in Batman Avenue at 7am. With hardly a whisper of wind, these were the perfect conditions to start a marathon. The city and the MCG looked glorious as the dawn Sun poked its head above the horizon and bathed the MCG in a golden light. If only it had stayed there for the next 4 hours! The view out to the MCG as I walked down Batman Avenue to the start line. The race lead car. Probably the only thing fast enough to stay in front of Dominic Ondoro for the entire race! I arrived at the start line at 6:45 to meet my mate Mark. This was his first marathon and since we were both aiming for a sub 3:50 finish we decided we would start the run together and see if we could push each other over the line. For me, it was my second marathon. In my first attempt last year I got a thigh strain and walked a large part of the course for a time of 4:55:54. With all the work I had put in this year, I was determined not to repeat that result. Our race strategy was simple. Aim for a fast first half split knowing that we would slow down for the second half when the Sun and associated heat would be a factor. We decided we would try to run with the 3:40 pace group for as long as possible and go from there. The 4:30 pace marker getting ready before the race. I was hoping that we wouldn't be seeing this guy during the race! The start line was the usual mix of pre-race energy and nervous anticipation. Everyone was pumped with dreams of a good run and a PB ahead. There was loads of conversation about the weather forecast and what impact it would have. It was another massive starting field this year with over 7000 runners testing themselves over the full marathon distance. We squeezed our way into the huddled masses and waited for the start gun. Luckily having so many people around us kept us comfortably warm despite the cool air temperature. Over 7000 people attempted the marathon distance this year. A young girl did a fantastic job of blasting out the traditional pre-race national anthem and then came the countdown to start. The race gun fired and a loud cheer went out from all the runners. The pro speedsters up the front were off and running. One of these guys, Dominic Ondoro, went on to win the race for the second year in succession in an incredible time of 2:11:30! A couple of minutes later it was our turn to pass under the massive start line. Our race was underway and it time to make amends for last year! I love the first few kilometres of the Melbourne Marathon. It's a picturesque run past some of the city's best features. From the start line we ran up Batman Avenue towards the city and were treated to an awesome view with the Southbank towers on the left, the Melbourne Cricket Ground on the right and the city straight ahead. Next we were running along Flinders Street with the famous domed facade of the station up ahead. 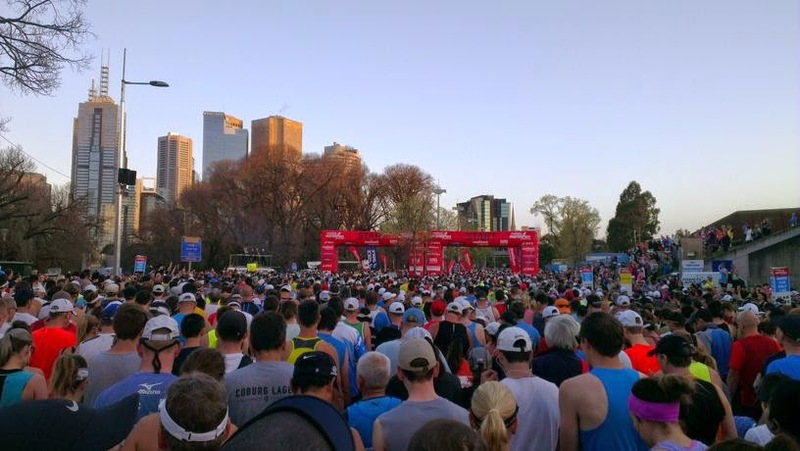 It all looked gorgeous in the morning sunshine and it was a surreal sight seeing Flinders Street completely covered in runners. We must have looked like a colony of tiny little ants from above. We then rounded Federation Square and crossed over Princes Bridge with its magnificent views over the Yarra River. We passed the Arts Centre on the right and soon enough we were beneath the shade of the boulevard's famous Elm and Plane trees. In terms of marathon starts it doesn't get much better than this! Course map. The red line is the marathon course. The congestion of runners in those first few kilometres ensured that the pace was really comfortable. It felt like a warm up. We were were running well below target pace and were keen to get around the slower runners. Passing them wasn't easy and required some nifty and careful footwork. Luckily Mark had the required technique down pat. I just had to follow his lead as he sliced through the runners ahead. We flew through Albert Park. Well actually Mark flew through Albert Park and I just followed! When we started the race we were behind the 4:10 pace group but in Albert Park we managed to pass both 3:50 pace markers and were definitely passing a lot more runners than runners passing us. 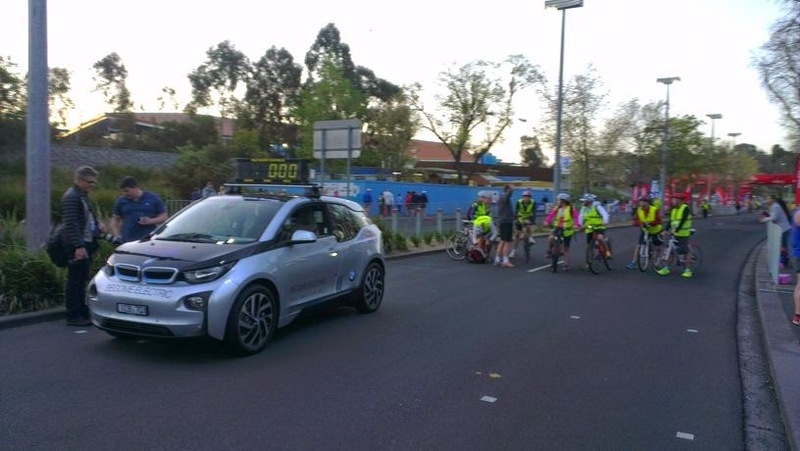 It was still pretty cool so I had only taken a couple of sips of water from the drink stations and cracked out my first gel just before exiting Albert Park at 13km in. Things were going very well and the body felt great. Could a sub 3:30 be on the cards? Runners travelling in three different directions in part of the Albert Park course. I knew I was doing well because we were running fast but I could still have a conversation. 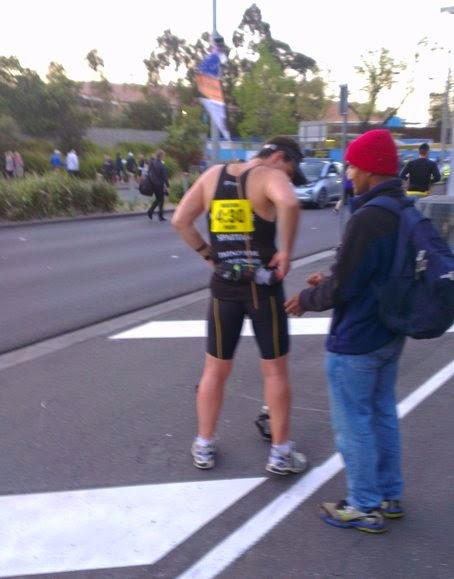 There were a number of Spartans (runners who have completed at least 10 Melbourne Marathons) out on the course, identifiable by their distinct yellow singlets and I managed brief conversations with a few of them during the race. 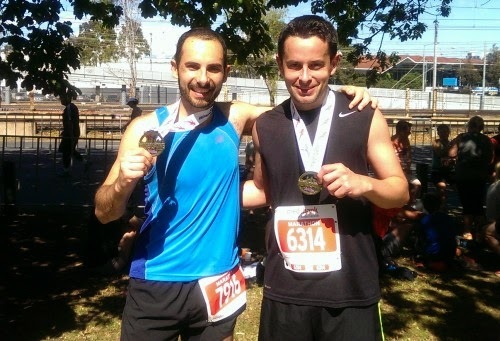 For one of them, this was his 37th Melbourne Marathon. 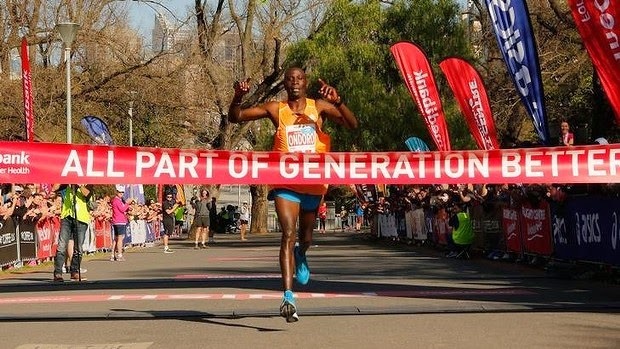 That makes him a Spartan Legend, meaning he has completed all 36 previous Melbourne Marathons. Incredible! He looked pretty comfortable so I'm sure he managed to tick off 37 and keep his Legend status. Coming back onto Fitzroy Street I was surprised by the number of spectators already lining the course. Most were there to cheer a friend or family member but they made sure that every runner got some encouragement. There were heaps of kids with signs cheering on their mum or dad and loads of people were handing out lollies to passing runners. We made it onto Beaconsfield Parade just as the leading female runners were passing Catani Gardens in the opposite direction. They were absolutely flying! We were moving along at a decent tick ourselves and soon enough our pace saw us catch the back 3:40 pace marker. I couldn't believe how well we were doing! It wasn't easy but I felt like I still had plenty of gas left in the tank. Part way down to Port Melbourne I spotted Tristan Miller from Run Like Crazy fame. I had forgotten his name so just yelled out "run like crazy!" and gave him a thumbs up as he ran past in the opposite direction. He spotted me and returned the thumbs up. Awesome! It was his book that motivated me to try marathon running in the first place. He ended up finishing in a very fast 3:07:50. We rounded the turning point at Port Melbourne to cheers from a large group of spectators that were assembled there. In front of us was the long and completely exposed road to Elwood. Up until now we had some shade from the buildings opposite the beach. Unfortunately that shade didn't extend to the other side of the road so now we were completely exposed to the Sun which was definitely getting stronger. We were cranking out sub 5 minute kilometres which is a lot faster than we were planning to run. I was still feeling pretty good but I was starting to wonder how long we could keep up this pace with the Sun starting to become a factor. Passing Catani Gardens we were somehow still pumping out sub 5 minute kilometres. The leading 3:40 pace maker was now behind us. It was at this point that my troubles started. My stomach started making those dreaded sounds that no runner wants to hear during a race. I had to slow down as a feeling of discomfort took hold. Mark was still running well and was slowly pulling ahead of me. I knew I couldn't hold out until the end of the race and I didn't want to hold him up. Conveniently there was some public toilets at St Kilda beach. They were dirty and nasty but in the circumstances I was just glad they were there. I lost quite a few minutes there and now I was running solo. I knew this would make the rest of the run harder. Also, the heat was becoming a massive factor. I had only been out of the Sun for a few minutes but somehow it felt a lot stronger now. The temperatures climbed pretty quickly during the race. I very quickly eliminated any thoughts of catching Mark and entered a new phase of race strategy that I like to call survival mode. Survival mode is all about getting back to a comfortable pace and getting your body over the line. Our exuberant pace for the first half was now looking like a very bad decision and I was really starting to suffer. I was still surviving when I reached the southern most point of the race at Elwood. I felt a small psychological boost knowing that every step herein would take me closer to the finish line. The crowds along Beach Road were tremendous but eventually even all their positive energy wasn't enough and I had to give in and take my first walking break. Walking breaks are just like 'breaking the seal'. Once you've had one the next one soon follows and that's just what happened. The back 3:40 pacer came past and I managed to hold on for a few minutes before having to take another walking break. To make matters worse my stomach decided it wasn't done and I needed to take another toilet stop. The public toilets at St Kilda appeared with perfect timing. Another few minutes lost but thankfully that was my last toilet stop! I passed a huge crowd of spectators at the bottom of Fitzroy Street and then somehow managed to climb up the hill towards the St Kilda junction. I was extremely glad for the drink station at the top. Whereas earlier in the race I was skipping drink stations, now I was taking on water at every opportunity. It had been more than 4km since the last drink station on Beaconsfield Parade and with my thirst getting the better of me I gulped down two cups of water and cooled down by pouring another over my head. I psyched myself up and pushed on into St Kilda Road. I was looking forward to some respite from the Sun beneath the shade of the elm and plane trees but the race organisers had other things in store for us. The half marathon runners were directed through to the shaded lanes on the left while marathon runners had to endure more time in the Sun on the right hand lanes. It was brutal and it was along here that many runners clearly struggled. I was taking walking breaks more frequently now but I wasn't the only one suffering. I saw one poor guy suddenly stop running and reach for his toes trying to stretch out what looked like the mother of all cramps. The Sun was having a good laugh at anyone who had overdone it earlier in the race or who had failed to stay hydrated. I was really struggling to keep my heart rate down and seemed to be constantly thirsty. I was feeling pretty sorry for myself at this stage. My feet were killing me and I was feeling some soreness from my right hip flexor. The wheels had well and truely fallen off and my pace had blown out well beyond 6 minute clicks as the length of my walking breaks increased. I was in what I like to call Sooking mode where you just want to get it over with but your pride won't let you throw in the towel. This is where the battle is all in the mind. It felt like ages before I reached the next drinks station at the Domain Interchange. This was definitely the busiest and most chaotic with hardly any runners not stopping to take on water or hydralyte. The volunteers were struggling to hand out cups fast enough and plenty of runners were taking an extended break here. I gulped down another couple of cups and had my third and final energy gel. There was nearly 10km more to go and I had around 2:50:00 on the clock. I was still in with a chance of a sub 3:50:00 time but I had to keep moving. I could imagine the parade of runners was quite a sight to the passengers on trams which were now going up and down St Kilda Road! I think some friends and family were using the trams to skip ahead of the runners to cheer them on again further down the line. Dedicated support crew!! It was a huge relief when I reached the City Road underpass. I was tempted to stop here for a few minutes and cool off but that would have meant sacrificing any chance of a 3:50:00 finish so I soldiered on. 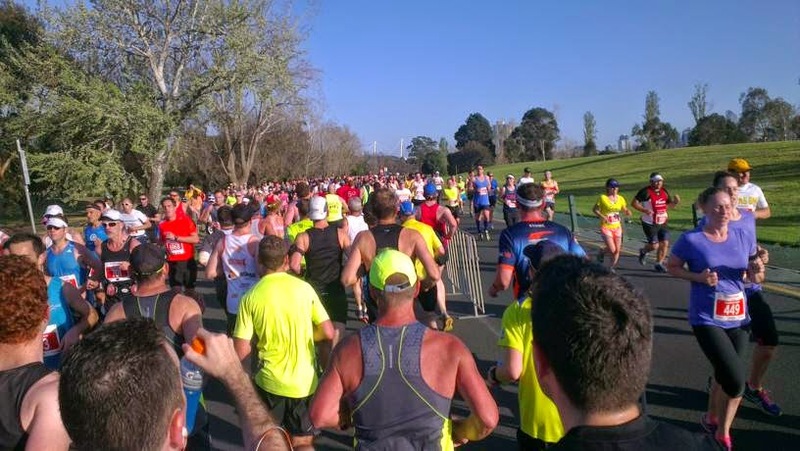 At the 35k mark, the half marathon runners split off and headed back onto St Kilda Road for the final run home while we marathon runners had to face the long steady western climb of the Tan. 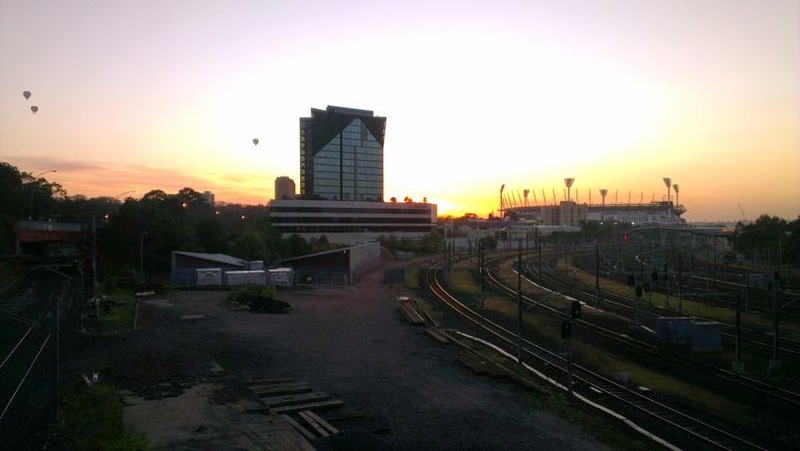 For those not familiar with running in Melbourne, the Tan is Melbourne's most famous and most popular running track. 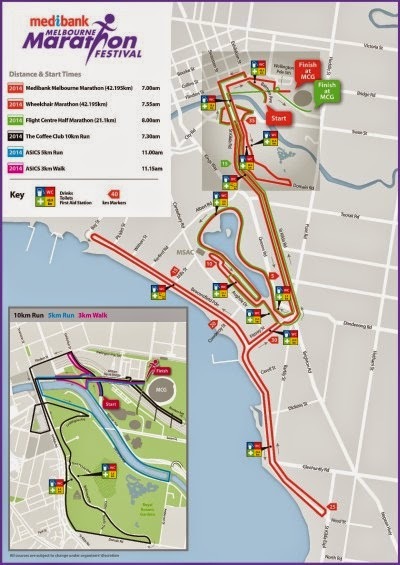 Its a 3.8km track that surrounds the Royal Botanic Gardens, Government House and Sidney Myer Music Bowl and your Tan lap time is the yardstick by which runners are compared. This is definitely where I lost most time in the race. My legs were feeling stiff, I was sore all over and the gradient on parts of the track felt impossible even though I had run plenty of laps here in the past. I was thirsty again and I was walking more than I was running. I finally reached the next drink station and took on another couple of cups of water. Then the final 3:50:00 pacer passed me. It was now or never. I had to stick with this group if I was to reach my goal time. I latched onto the back and was surprised by how quickly they were running. I lasted about a kilometre along Birdwood Avenue before I had to stop. I watched the yellow marker flag disappear into the distance and with that I knew all hope of a 3:50:00 race was dashed. I quickly did some calculations and reassessed my goals. I could still make sub 4 hours even with some walking time. I walked up the final, steep hill on Birdwood Avenue and made it onto Domain Road. I started running again, determined to not let the 4 hour pacer pass me. I think most runners would agree that the section of the course on Domain Road was quite dangerous. Trams were running so only a narrow section of the road could be used by runners. Barriers were in place to stop runners going onto the tram tracks and the legs of these barriers were a major trip hazard. Incredibly there was still parked cars on the road and there were points where the curb jutted out at pedestrian crossings creating another trip hazard. Running on the footpath was not much safer thanks to the uneven pavement warped by tree roots. I don't remember it been like this last year so hopefully organisers fix it for next years race. I safely navigated Domain Road but then I started having other problems. I had taken on a lot of water at the last few drink stations and now I had a stitch on my right hand side. I had to walk and massage it out. The day couldn't get much worse! On the bright side at least I was still moving. The last 3kms of the race were a scene of carnage (well at least in marathon terms!). Every few hundred metres I was seeing runners on the side of the road either being attended to by first aid or taking an extended rest break. It would be such a shame to come this far and not be able to cross the finish line! The crowds really picked up in size and volume once I hit Federation Square and they were giving the runners a huge boost. It was an incredible feeling as I turned the corner onto Flinders Street with the yells of support and encouragement from every direction. I tried hard to keep running but eventually I needed another break. Passing runners tried to push me on but I just didn't have it in me. Less than a kilometre from the finish I saw a runner who was slumped by the roadside and was being put on a drip by paramedics. This was one tough race but I was determined to be tougher. I started running again down the Wellington Parade hill but was soon stopping again just past the final drink station. A spectator ran up to me and told me I was literally two corners from the finish. I thought he might have been making it up to try and get me going again. Then I saw he had a runners bib on. He had just finished the race. "It's a only a few hundred metres" he told me and then gave me a gentle push in the back. That's all I needed. I started running again. The crowd was getting louder and thicker. I turned the penultimate corner and I was surprised by how many spectators there were. With that crowd there I think I could have run to the finish even if I was injured. Something automatic took over and the pain just disappeared. It was exhilarating! I reached the final corner and to the left I could see the finish line. Above the din I heard some familiar voices. On the other side of the corner I spotted my wife, step son and Mark's wife calling me out. I forgot I had a race to finish and ran over to them to give them all high fives. This was definitely the highlight of my day! Great action shot from my wife as I ran in for a high five! My body must have thought the race was over because when I took off again I felt a sudden and sharp cramp in my left leg. I was on my final legs now but there was no way I was walking to the finish so I sucked it up and ran through the pain, dragging myself across the line. As soon as I stopped moving I started feeling light headed and a wave of nausea passed over me. I needed to sit down in some shade and I needed water. The finish line could only be described as chaotic. It wasn't clear what I needed to do next or where I had to go. Or maybe it just seemed that way because I was in a bit of a daze. I eventually got moving again and found my wife, got my participant's medal and then found water. I felt sorry for anyone who was still out on course because it was quite hot in the sun now. Looking around you could see that this marathon had hurt a lot of runners. There were loads of runners getting some sort of medical attention, mostly for dehydration and heat exhaustion I suspect. The attrition rate was high with 6415 out of the more than 7000 starters actually finishing the race. But of course most people were happy and proud of their accomplishments in the conditions, Mark and myself included. It turned out Mark finished only a minute ahead of me! 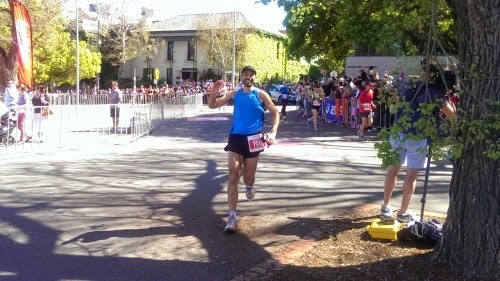 The heat had gotten the better of him on St Kilda Road and he lost a lot of time from the 30k point. My race result and split times. When I saw my split times later in the day I couldn't believe we were going at 4:43 clicks for the 10-18km section! It would have been good to see a half marathon split (not sure why we have an 18km split?). My pace for the last two kilometres tells a pretty sad story! In retrospect a 4:43 pace between the 10 and 18 kilometre marks was way too fast but this gave us a lot of time in the bank when we struggled later on. I suspect I would have suffered in the Sun even if we ran a minute a kilometre slower. What I would do differently is hydrate better. We should have been stopping for water at every drink station from the very beginning. I would also carry my own water supply. The other thing I needed to get right next time around is my pre-race diet. I should have had pasta the night before instead of breakfast cereal! That's the second year I've had stomach problems during the marathon and this time it cost me at least 5 minutes plus lost momentum during the race. All in all I definitely enjoyed the 2014 version better than last year. The crowds were awesome, I didn't get injured, I cracked the 4 hour barrier and I got to run most of the distance with a friend. Despite struggling in the heat it was an amazing experience and I will certainly be back next year for my third attempt. Until then I'm looking forward to the City 2 Sea next. Time for some interval training! !